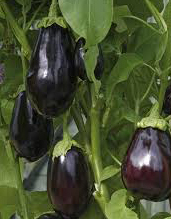 Aubergines need warm, sunny, humid conditions. They are best grown in a glasshouse. In early March sow seed very shallowly in plugtrays in good quality seed compost. Sow one seed in each plug. Cover the plug tray with glass and then newspaper. Turn the glass over daily. Germination is slow and needs a temperature of 21C degrees. As soon as the seedlings are 5cm high, pot them on to 9cm plastic pots. Maintain the temperature at 18C degrees. It is important to keep the plants in very good light. Give organic liquid feed once or twice a week to maintain growth. When the first flowers appear, pot the plants on to 20cm pots using a soil-based John Innes No 1 type of compost. This should be no sooner than early May in an unheated greenhouse. Give an organic liquid feed at every watering at this stage. It is necessary to feed and water Aubergines a little but often. Plants should neither dry out nor become waterlogged. Maintain the temperature at 15C -18C degrees. Space the plants at 45cm from each other. Mist the plants in the early morning and give good ventilation. Buckets of water placed between plants create a humid atmosphere. Whitefly can be kept to a minimum by growing pots of Basil, and pots of Tagetes (bedding French Marigolds) and dotting these around the greenhouse. Remove the growing tip of each plant when the plant is 23cm tall. This will encourage branching. Only 3 to 4 branches should be allowed per plant. Space the branches out and support them with string attached to overhead wires or bamboo canes. The fruit will become heavy. Restrict the number of Aubergines to 5 or 6 per plant. Remove any further flowers that appear and any straggling side shoots. Also remove any embryonic fruits that develop on the main stem.As soon as the fruits start to set, feed the plants with a high potash feed, such as comfrey, every 10 days. Harvest Late August to September, cut Aubergines with a sharp knife when they reach 15cm – 20cm in length and are a deep purple colour. The plants will not tolerate frost, so if frost is forecast, cover the plants with horticultural fleece (which can be purchased by the metre).